If you have been in New Road recently, you will have seen that Brighton Unitarian Church is surrounded by scaffolding. The Grade II listed frontage was placed on the Heritage At Risk Register after surveys revealed that rainwater was seeping behind the stucco frontage, threatening the beautiful Doric columns. Grants, including one from the Heritage Lottery Fund, together with contributions from the wonderful people of Brighton, meant that in March 2018 they could start rebuilding their beautiful building. But since then, they have had some very bad news. The structural experts repairing the church have discovered that the pediment – the triangular section at the top of the columns – is in an advanced state of collapse. The timbers are extensively rotten, the metal supports are corroded and the stonework is in danger of falling off. 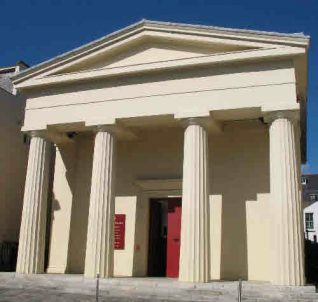 Brighton Unitarian have made to support their Portico Rescue Appeal and see for yourself the extent of the damage and why they are asking for help.